Fry the spinach in a little oil in the pan quickly. 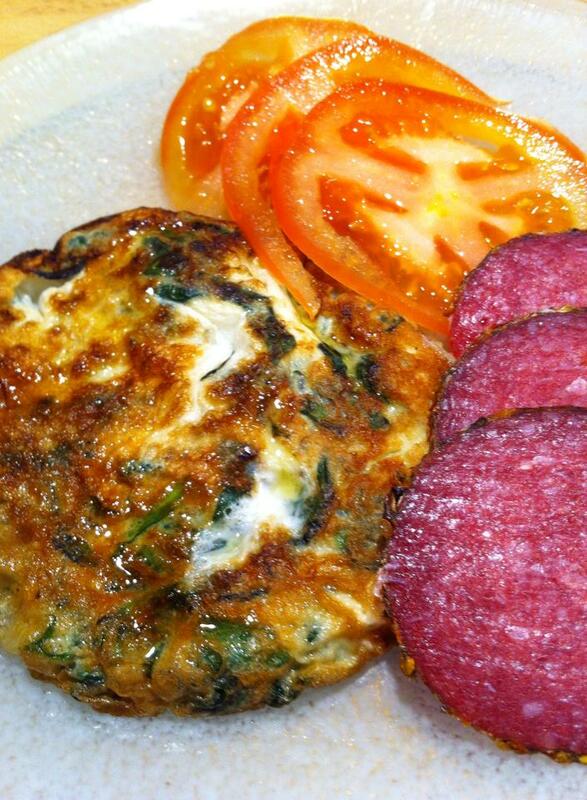 Whisk together eggs, spices and stir into cheese and the fried spinach. Turn a little more oil to the pan and gently tap down omelette batter. Let it get nice color and then flip. Let fry until nicely browned on the other side. Place on a plate and sprinkle with truffle oil. Serve with fresh tomatoes and some salami. Previous Post CONTEST TIME – enter to win! It looks so yummy , thanks for your sharing. Wow, this looks beautiful.What kind of cheese do you recommend for this recipe? Love the tomatoes as a side. Yum, that sounds wonderful! I’ll have to try that recipe! !